Paramount has announced that it will release 10 movies for Windows Phone 7 handsets that will include all the kinds of extras you would expect from a DVD, plus extra interactive content. The movie studio will release movies like Zoolander with a host of extras using Silverlight, meaning that people who buy the film will not lose out on the bonuses - although this is only for the US and Canadian markets for now. Plus, for those people who really want to dig deep into the movie, there is trivia by movie game specialists Scene It. "Through our relationship with Microsoft, we're able to provide consumers new, enhanced ways to enjoy movies from anywhere on Windows Phone 7," said Geremie Camara, Vice President Product Development for Paramount Digital Entertainment. "Using Silverlight technology and adding interactive and social networking features, our enhanced movie apps transform the movie viewing experience into a true entertainment experience." Other movies that will feature include School of Rock, Waiting for Superman and GI Joe: Rise of the Cobra. 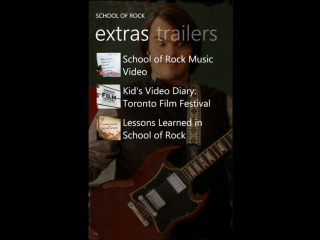 "Windows Phone 7 is backed by a rich developer ecosystem that is creating a variety of quality apps and games, like Paramount Entertainment's movie apps, that take advantage of the phone's unique features and design," saidTodd Brix, senior director, Windows Phone Marketplace, Microsoft Corp.
"We're proud to have these Paramount titles that offer unique experiences for consumers exclusively available on Windows Phone 7 this holiday season." We will wait and see if the studio manages to do a deal to bring this kind of offering to the UK Windows Marketplace.